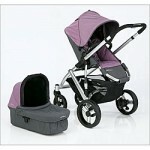 Everybody always wants to know what is the best stroller I can buy? To that I say, the perfect stroller is different for every family. Today I’m going to help you figure out the differences between the most popular Second Seaters; strollers which can be used as a single or a double. Up first is the Uppa baby Vista. 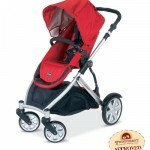 The Vista is a very popular stroller and has many great features. It’s the only one that comes with a bassinet so that your baby can use it from birth without having to necessarily purchase an additional car seat adapter. It has a nice roomy seat, a huge UV protected canopy, comes with a rain cover and bug net, and has a 4 positon adjustable handle. Vista pushes really nicely over pebbles, grass, and snow. The recline is one handed and very simple to use. Uppa has recently come out with fabric swatches for the Vista so you’ll never get bored with this stroller around! The Vista folds with the seat in the forward facing positon or you can take the seat off and store the frame and seat separately. The back wheels come off with the press of an inner button if you’re looking for a really compact fold. One thing that may bother about the Vista is that the second seat attachment does not recline. However, it is a pretty large seat and it has it’s own separate canopy. If you have a baby and a toddler then the Vista is a great choice for your family. 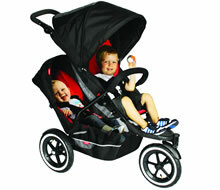 Another popular second seater for parents who want more of a jogging type of stroller is the Phil and Ted line. Phil and Ted’s makes a few strollers with second seat options including the Explorer, the Vibe, and the soon to be released Promenade. The Phil and Ted is heavier than the Vista but it’s a narrower stroller with tighter steering which makes it easier to get around small spaces. 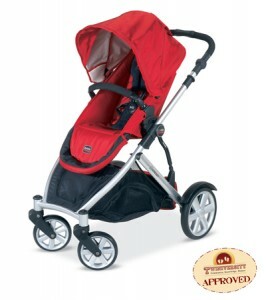 Phil and Ted’s strollers all have air tires which are preferable for Moms doing a lot of all terrain strolling but can become annoying if you are not someone who wants to be refillling your tires on a monthly basis. Like the Uppa, the Phil and Ted’s is made to hold an infant and a toddler or two toddlers but it cannot hold two infants at the same time. The Britax B-Ready is the newest of the Second Seaters and it pretty much mixed together features from both the Vista and the Phil and Ted’s strollers. The B-Ready has the most options when it comes to configurations and can hold everything except two bassinets. Britax includes accessories that the other two don’t including an adult cup holder and an integrated adapter for Britax infant seats. Another feature that the Vista and Phil and Ted’s does not have is the ability to fold with the second seat which is very convenient if you have a smaller car or less time to start taking apart your stroller when you have two children! The wheels have covers and the handle adjusts in a circular motion. 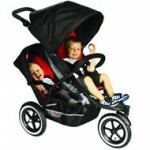 In general it is a great stroller if you are not worried about the extra weight compared to the Vista. However, the top seat has only three recline positions which is less than the Vista or Phil and Ted’s. On the other hand the second seat reclines which is a first for Second Seaters. Pricing on the Vistas and B Ready is almost the same and differs depending on which add ons, such as a bassinet, are important but if you’re looking for the most economical version of a Second Seat than Phil and Ted’s wins hands down with it’s Classic V2 in the $300 range. Second Seaters are a terrific alternative to the side by side and tandem strollers on the market today and I continue to love the feedback coming from all them. Keep in mind that you need to choose one that will fit to your lifestyle. If you need lightweight and have two children of separate ages Vista is the one for you. More of an athletic parent? Stick with Phil and Ted’s. Twins or two children close in age? Britax is your best bet.